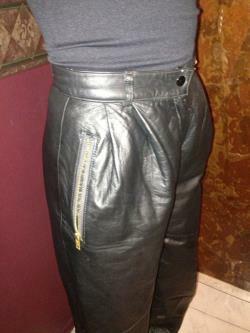 These 'one of a kind' leather pants, resembles the 'mc hammer' look, with snaps and a zipper at the bottom of the leg. I recall purchasing these down in lower manhattan in the late 80s don't recall the name of the store but i do recall wearing these out to the club and getting many complements. There are no tags on pants. 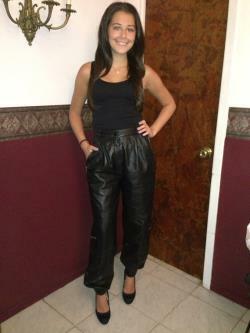 I can guarantee you will be the only one wearing these beautiful soft leather pants. 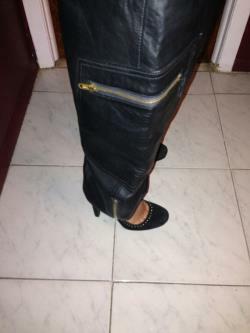 No tag attachedside pockets with zipperinverted pleats at wasit soft leather size 8 (1980) wasit: 26 incheship: 40 incheslength: 30 inches all vintage items are final sale and can not be returned or exchanged darlings.